Winter 2019 Issue on Sale Now! 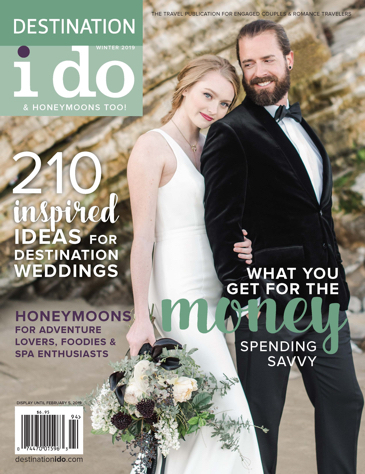 The Winter 2019 issue of Destination I Do hits newsstands today! While our blog and website are constantly tended with TLC, our magazine is the bread and butter of what Destination I Do is all about. Whether you’re in the process of planning your destination wedding, honeymoon or simply a romantic getaway for two, this issue has something for you. (Rhyming unintended!) This is Destination I Do’s 28th issue and, much like a fine wine, we like to think the magazine is only getting better with age! In this issue, you’ll find the trusty departments some of you may have come to count on, as well as some new and exciting features that strive to inspire and stay ahead of the curve. Without further ado, our Winter 2019 cover is one of our all-time favorites and perfect for the upcoming winter season! What’s more fun than getting all decked out for a black tie event? Doing it barefoot, of course! The cover image is from our “Barefoot and Black Tie” Fashion Forward photo shoot and combines the two style extremes in a flawless and fun way. Our models are shown in their wedding attire, ready to say “I do.” Shot on the beaches of Santa Barbara, our bride is wearing the “Alexii” gown from White Runway and the groom is in a black velvet tuxedo jacket and matching black slacks and bowtie from The Black Tux. Her organic, hand tied bouquet by Precious & Blooming paired with her “Dash” necklace from Ariel Jennifer Taub, set off her picture-perfect hair and makeup by Brianna Stewart-Olcese. Planning and design by Onyx + Redwood, production by Be Inspired PR and photography by Sanaz Photography. If you can make it beyond the glossy cover, you’ll find lots of goodies inside this issue. We’ve got a wonderful batch of features that include a variety of destinations to suit any number of tastes and preferences. Are you considering a wedding and honeymoon in the same state, but desire different backdrops? Here we explore the idea with two examples of City & Sea Duos in sunny Florida and California. Don your finest seersucker suit and prep your palate for a mint julepwith our Sojourn to the South section. If it’s honeymoon awe you’re after, we’ve got some outstanding recommendations in the form of Botswana, Galápagos, Italy and Ireland in our Honeymoon Hideaways section. This is just a sampling of this issue’s special features, so you’ll have to pick up a copy to explore more! Our trusty departments are also back, offering the latest and greatest in fashion, etiquette, real-life weddings and more. 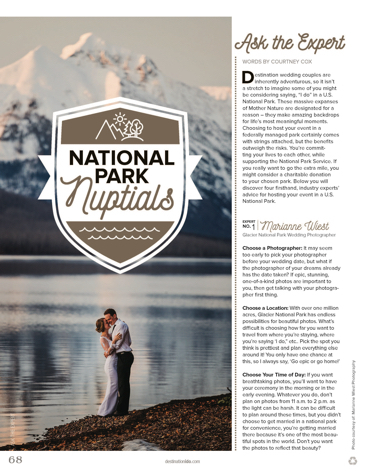 Be sure to check out our newest article from The Honeymoonist that focuses on world-class spas and our Ask the Expert story all about saying “I do” within the beautiful confines of a U.S. National Park. This issue also includes two photo shoots within our Fashion Forward section: “Married in Mayakoba” and “Barefoot and Black Tie.” Our Guest Book feature is especially riveting with its “Spending Savvy: What You Get for the Money” article. Discover how five different couples achieved the wedding of their dreams, each with a different budget, guest count and destination. Last but not least, our Real-Life Weddings section is also back. This issue’s batch of real-life weddings leaves us speechless. How to describe such a unique group of couples and styles? 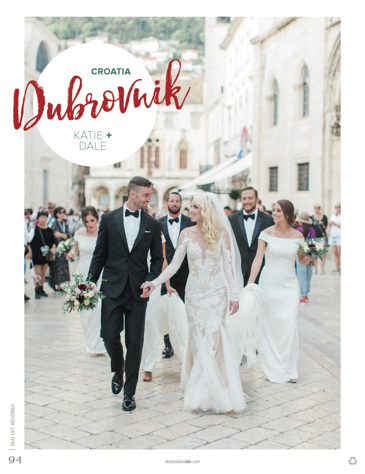 At the end of the new issue, you’ll find a coastal Croatia wedding away, a friendly farm celebration in Tennessee, sophisticated nuptials in Costa Rica, a subtle pastel soirée in Scottsdale, a fête full of fashion fusion in Alabama, a vintage event among the vines in Solvang and million dollar views in Tuscany. Of course, this is just a sampling of what you’ll find between the pages of our Winter 2019 issue. To get the whole scoop, be sure to pick up a copy at your local Barnes & Noble, Target, Safeway, some of the U.S.'s major airports and select newsstands. Can't wait? Visit our website to order your issue today or view our digital edition of Destination I Do! As always, we at Destination I Do would like to take a moment to thank each and every person who helped to make this new issue what it is! 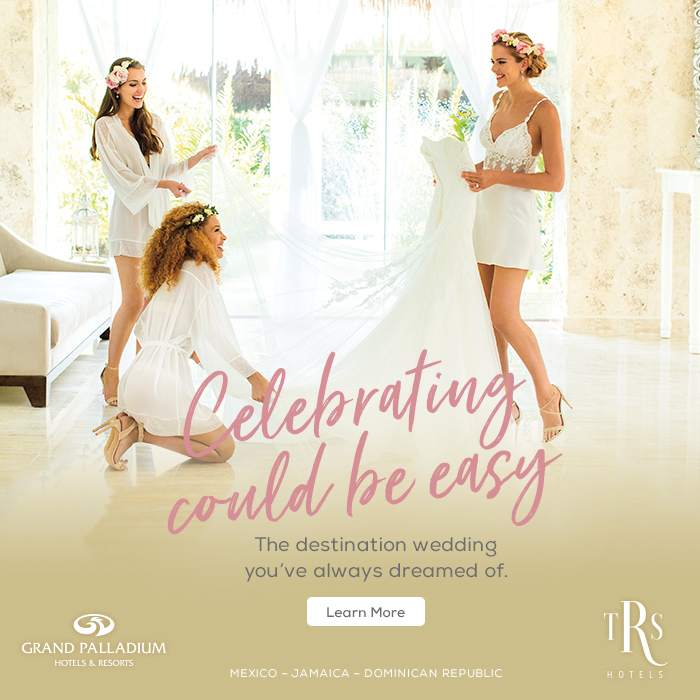 From our real wedding couples, to the talented photographers and creative contributors, thanks for helping us to continue to strive to inspire destination wedding couples and romantic travelers the world over! Happy Planning!